A few weeks ago I had the opportunity to capture the most sweetest proposal at Brooklyn Bridge park. Brandon reached out to me back in March, telling me he had plans to propose to his long time girlfriend Lisa. Cool! I was so down for surprise proposals. They are super exciting and I don't know about you, but I always get a rush right before it happens. I try to figure out if I should hide, or if I should just act like a tourist taking photos of the skyline (I went with the latter on this one). Anyways back to our engagement story. Brandon had told me he wanted to propose on a Saturday in May, and had been sending me photos of the location where he wanted to pop the question. Everything seemed like it was good to go. In fact I was a little nervous about the weather because according to my weather app it was set to thunderstorm that day but it turned out to be such a beautiful sunny evening! What a relief! While we were waiting for his soon to be fiancé to arrive, he told me how he had planned this day for months! The day started by him leaving his house early in the morning. He left a note with some flowers on a table for Lisa. The note had instructions for her to dress up and be ready later that day at 5:45. He even had her outfit picked out down to her red bottom Christian Louboutin shoes! (I must say Brandon has pretty good taste.) He arranged for an Uber to pick her up from their UES apartment, meanwhile she had no idea where the Uber was taking her. 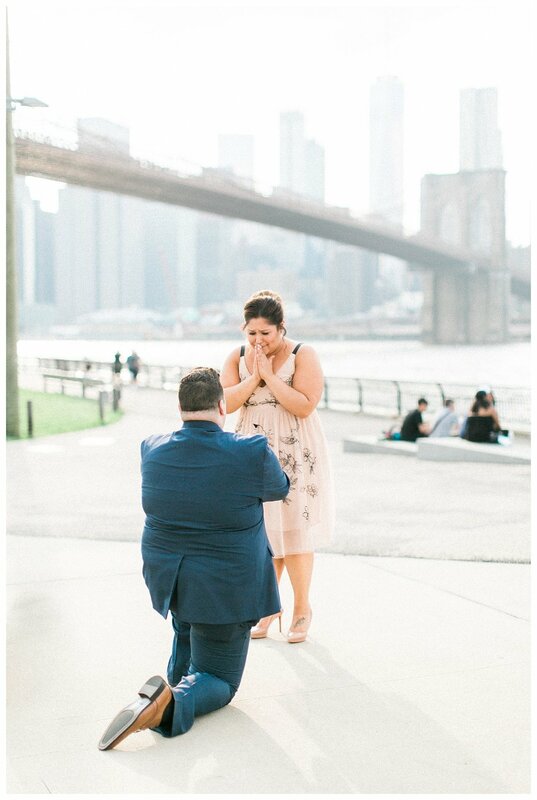 Once she arrived to the park, he met her at her car and walked her to this beautiful spot overlooking the sky line, where there were luckily very few people and popped the question there! Obviously she said yes, I mean her face says it all! We took some time to get a few portraits and after we said goodbye, they made their way to an engagement party that Brandon had planned with close relatives and friends. Talk about a proposal story! Check out the photos below! I am so glad Kurt & Shirley chose Fort Tryon Park for their engagement location. It has been somewhere I've been wanting to photograph for a really long time but couldn't make the time to travel up there until now. It's a gem hidden among the skyscrapers of Manhattan all the way uptown. With views of New Jersey just across the Hudson River, once you arrive, you no longer feel like you're in a bustling city. We arrived just in time to catch the sunset that lit up the autumn leaves. Everything was a fiery shade of orange and yellow. Kurt & Shirley were amazing during their session and really let their relationship show through these photos. These two will be going back to their home town in Canada to say "I do" next year!